3) Our ability to see colour. Sometimes the delicate cells of the macula become damaged and stop working. Almost certainly it is some sort of nutritional deficiency that can happen at any age, although it tends to happen, as people get older and is referred to as age-related macular degeneration. Dry AMD: Around 90 per cent of people diagnosed with AMD have the dry type. It occurs when the cells of the macular become malnourished and start to waste away meaning that these cells can no longer function properly. Dry AMD is also called non-exudative AMD. Wet AMD: this is less common (10 per cent of cases) and occurs when tiny new blood vessels grow between the retina and the back of the eye when blood flow is failing again from some sort of malnourishment or cardiovascular diseases. These blood vessels leak and bleed as they grow causing scarring of the macula. Wet AMD is also known as exudative or disciform degeneration. Eventually you may only have a small amount of peripheral vision. You will need a good consultation with an eye doctor to identify precisely what is wrong. BUT, most Doctors do not believe anything can be done. You are going to need to take your own health in your own hands. Eyesight Action will help your eye health recovery. What treatment is available for AMD? 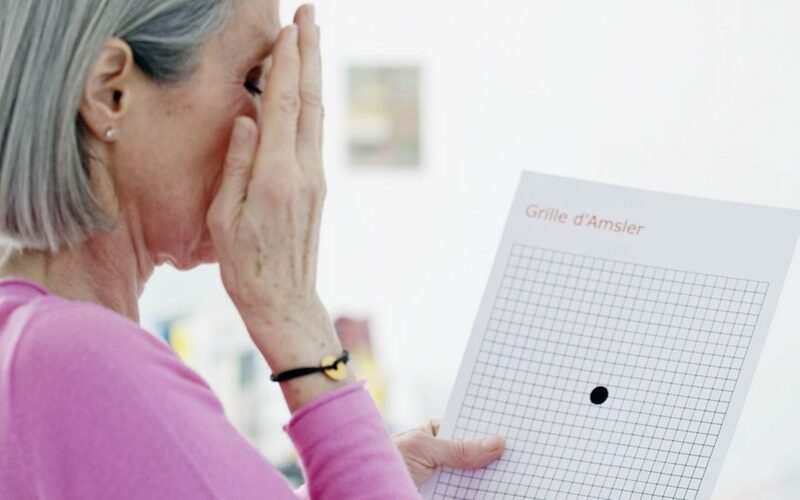 Although there is currently no medical treatment available for dry AMD, you can be helped to see well with nutritional supplements and stimulation of points around the eye with micro-current stimulation. Some doctors already will offer or refer you to this although the majority while not offering any treatment themselves do not. People with wet AMD can also be helped to see well with the same nutritional and micro-current stimulation program. There is also some laser treatment available for wet AMD, however it is not suitable for use in the majority of cases and can leave you permanently worse off. The laser should be used as a last resort. Laser, a device that gives an intense beam of light, can sometimes treat wet AMD. This is usually done as an outpatient and although it may cause some discomfort, is not painful. A special contact lens is put onto the eye to help focus the laser onto the macula and the heat from the laser beam then destroys the leaky blood vessels. The benefit of this treatment is that it can prevent further degeneration of the macula. However, the laser treatment can damage healthy macula cells meaning that you might lose a little sight to save a lot. Laser treatment is only useful in about 10 per cent of people with wet AMD and this always where people have reported their symptoms early. A new treatment for wet AMD has recently been announced, however this treatment is still in the experimental stages and is not openly available to everyone. This new treatment is called photodynamic therapy (PDT). With PDT a light-sensitive dye is injected into the bloodstream and is transported to the retina at the back of the eye. This chemical highlights the blood vessels that are growing abnormally. A low energy or ‘cold’ laser beam is then shone onto the macula. This makes the chemical react and destroy the leaking blood vessels without damaging the healthy tissue around the affected area in the back of the eye. More than one treatment is usually required. The long-term effects of this treatment or its success have yet to be proved. It may only help those newly developed wet AMD, when it has been caught in the early stages. PDT is unsuitable for long-established wet AMD and cannot restore sight that has already been damaged by macular degeneration. PDT cannot be used to treat dry AMD. There are a number of other possible treatments currently being explored, such as radiation therapy, drug therapy and surgery. The development of new medical treatments takes a long time and must be rigorously tested before being made available to the public. The benefit of these types of treatments remains uncertain and you should consider the nutritional route first.